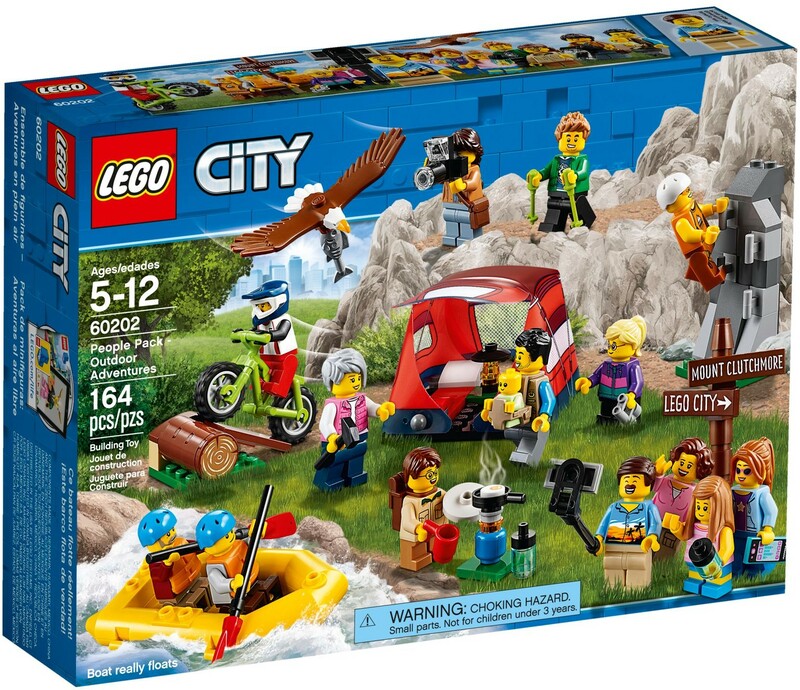 I’m a big fan of these CITY People Packs. We’ve had three of them – one every year since 2016 so far: 60134 Fun in the Park, 60153 Fun at the Beach, and this one – 60202 Outdoor Adventures. 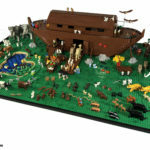 With 15 minifigures, and what has consistently been some brand new and highly sought after parts, these packs are sure to be high on the list for fans, and not just one, but multiples if possible. Due to the very different nature of these sets, being low in parts but high in minifigures, I’m going to break it down into the different scenes and not give it a score at all, as it’s hard to judge. Either way, you know it’d be high! There’s a whopping 28 new elements that are, as it stands right now, still exclusive to this set, which is a crazy high number. That means that there were more when this was released. 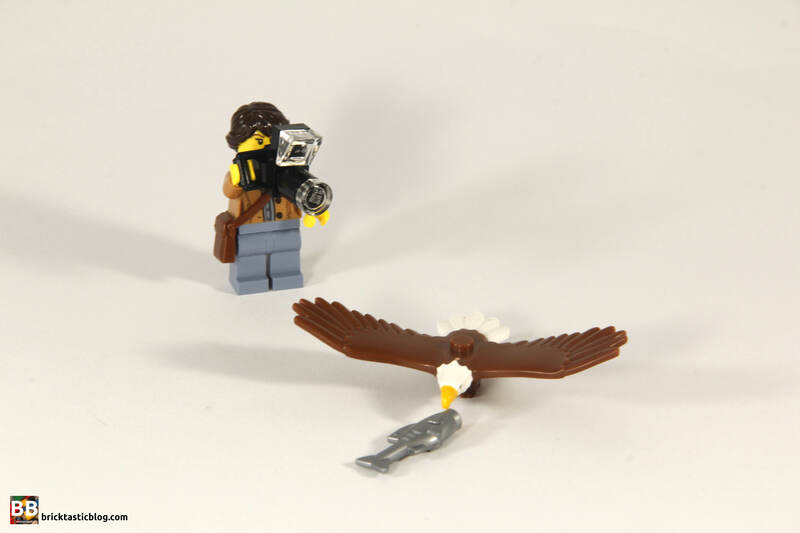 Let’s take a look at the first of the two instruction booklets, with the photographer, and the eagle and fish. The female photographer has a pair of light blue pants and a shirt, with a brown jacket, and a double sided head showing a smile and a wink. 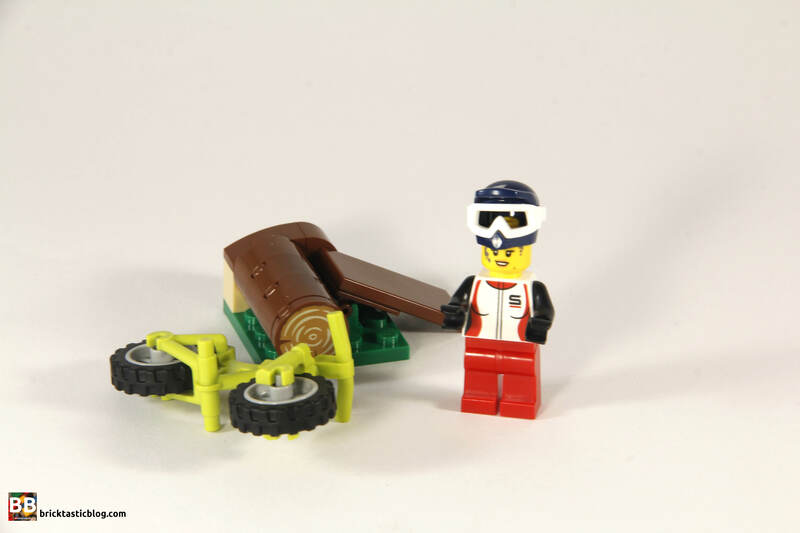 The head and torso of this minifigure are the first of the brand new items. She’s also got a reddish brown satchel, and a brick built SLR camera. 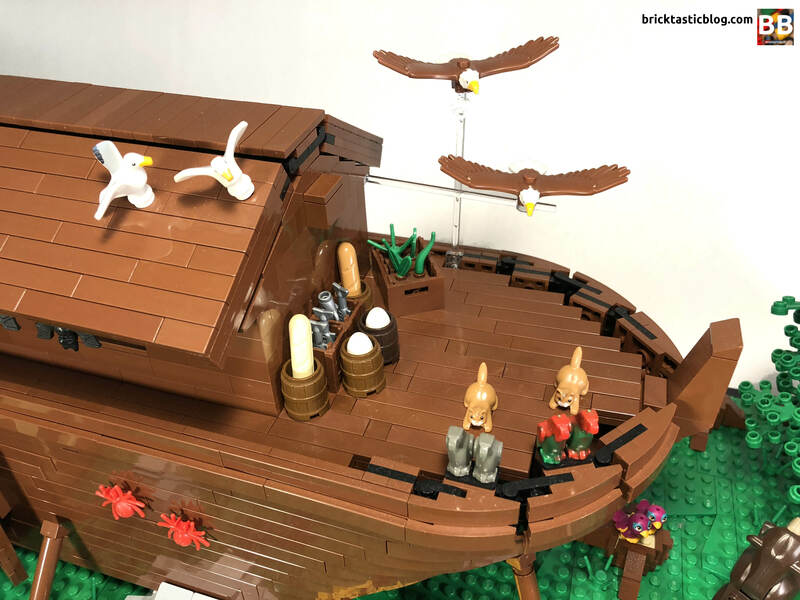 After my Noah’s Ark build, I’ve become more and more interested in LEGO animals, and the new bald eagle was a must have for the MOC. This element showcases some stunning detail and printing, and the shape of the wings are incredible. The lines between the three colours are clean, and having an anti-stud underneath allows you to connect it to a stud, or onto a fish, like it’s holding on to it. Next up is the hiker, and the father and baby. The hiker is wearing a green jacket over what looks like a sports shirt. In another fantastic example of LEGO continuity within sets, it’s actually the uniform of the Hockey Player from CMF Series 4! I love it when this happens – it’s so clever and shows the level of detail the designers go into when creating these products. He’s also got a brand new head, and carries a couple of bright yellowish green hiking poles to help him get across the tracks. The father’s got a tan vest on with a stack of pockets and compartments. 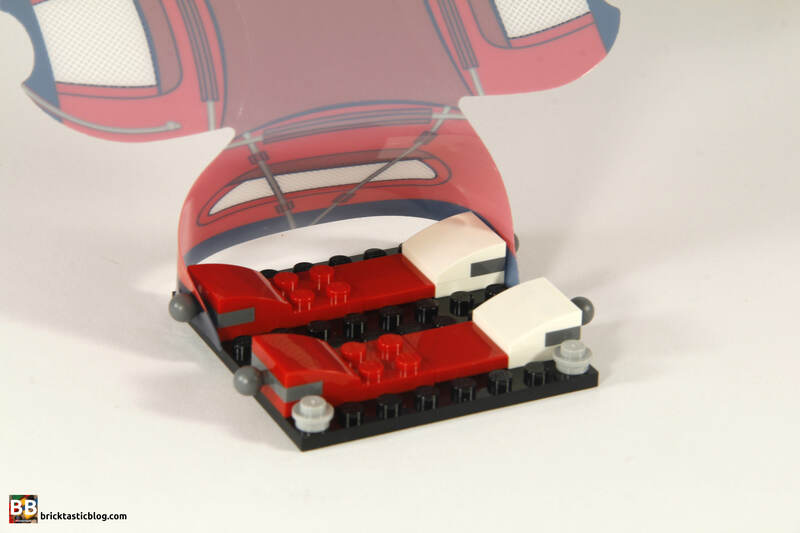 This torso was also seen in the fifth-wheeler set 60182 Pickup & Caravan, so it’s great to see it again. He’s also got a new head (I sense a trend here), but what’s the most exciting about this set is the baby carrier. It matches the torso well, and holds the new baby (in spring yellowish green) in nice an snug. This is a super exciting inclusion. Up next is the young kid – I think he looks a bit like a scout. He’s also got a new torso and head, with the torso somewhat resembling a basic scouts uniform. He’s a happy lad, with some glasses on, so he can check what he’s doing – in this case, making some fried eggs on a portable gas bottle and cooker. It’s incredibly simple, and makes perfect use of a blue minifigure head as the gas bottle. 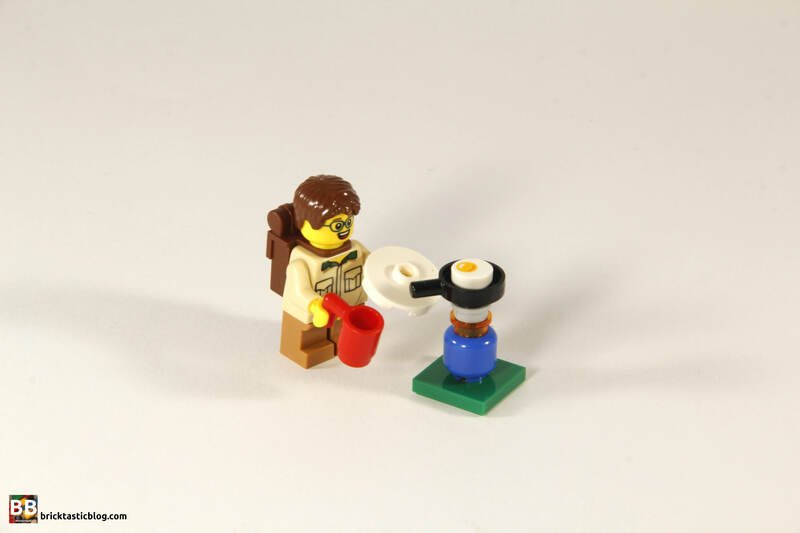 The highlight here is the printed round 1×1 egg tile, sure to come in handy in many situations! It’s a pity the old camping rucksack is used, instead of the newer one from CMF Series 16’s The Hiker. 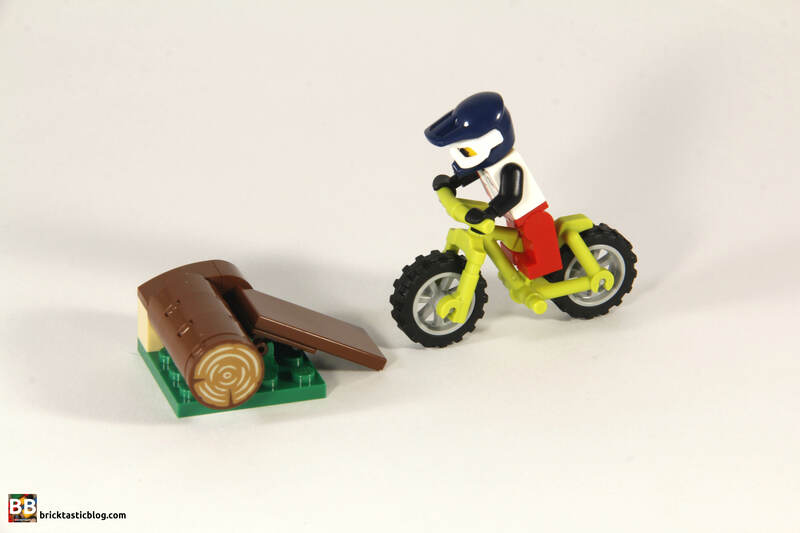 Next is another one of my favourites – the mountain biker. With yet another exclusive torso print, as well as a new double sided head and motocross helmet in a brand new colour, plus a new bike element with fatter forks, this model is very exciting. The combination of the white goggles looks awesome, and the printing on the rider’s torso looks excellent. It’s not too detailed, but looks perfect for the situation. She’s got a determined look on her face, and then a happy smile with some mud on her, which is brilliant. The bike looks amazing, with deeper angles on the handlebars, chunky tyres and wider forks. There’s also a small ramp to ride over, made from a cleverly built log, 2×4 reddish brown tile, and a rocker plate and bearing. The bearing in dark green has only appeared in three other sets since 2017, so it’s quite rare. Also rare is the 2×2 round tile with woodgrain print, which is very useful. I’d love to have a whole stack of these! Keeping with the action sports theme, let’s move on to the climber, in an orange singlet (with the same branding as the mountain biker’s gear), orange pants with harness, and a head with orange glasses and a white helmet on top. The head we’ve seen many times before, however the torso is new, and the legs seen in both the Jungle and Arctic CITY subthemes recently. It’s a great use of an existing part. 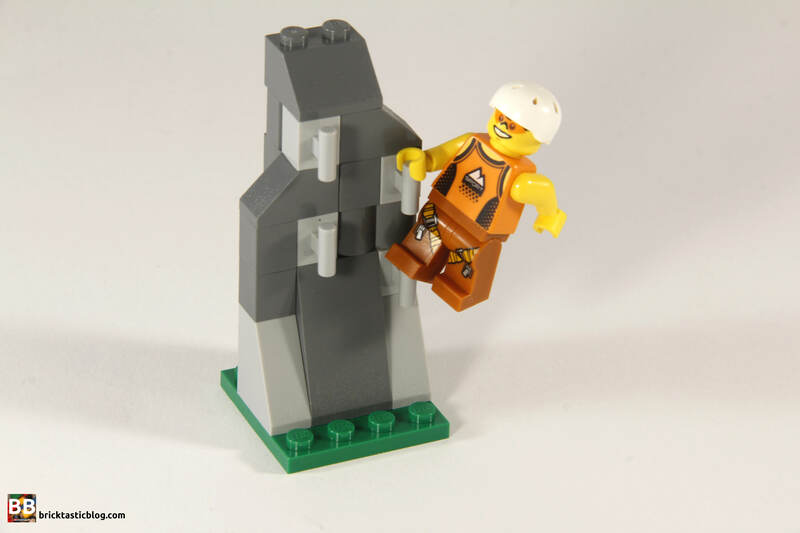 The mountain climber obviously needs a mountain to climb, and that’s what LEGO has provided! There are some vertical hand grips scattered around the mountain, and it looks great for such a simple build, with different shades and textures. 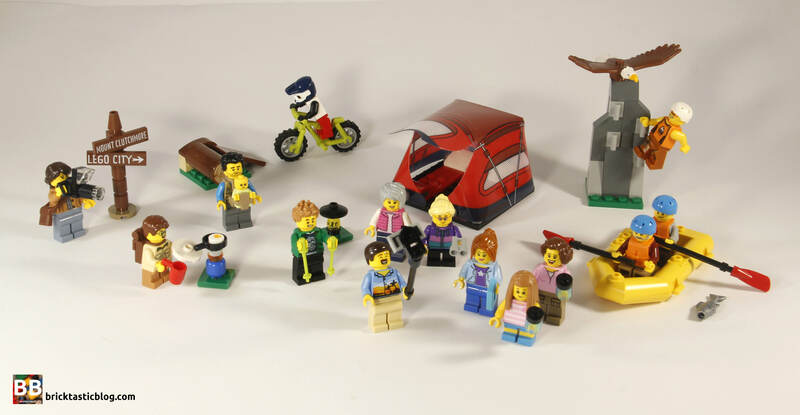 The second instruction booklet brings in a few more builds, starting with the travelling family. It looks like we’ve got a Dad, a Mum and two daughters. 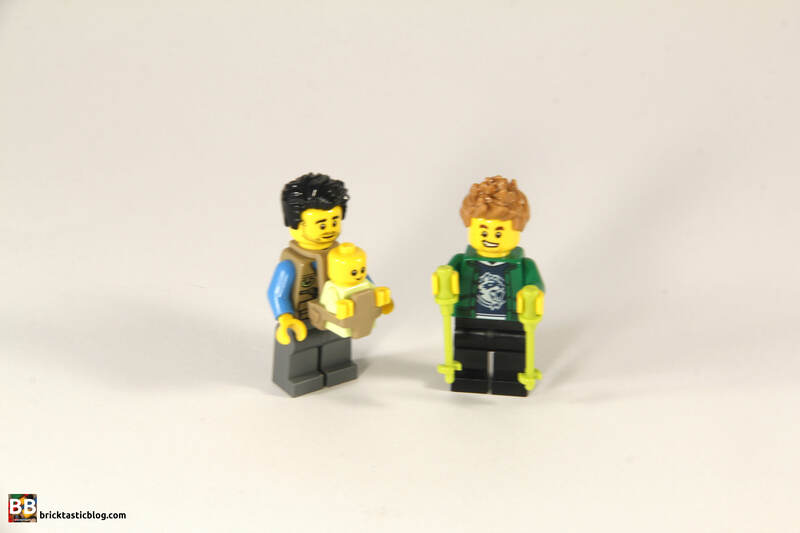 I love the Dad minifigure. He’s got a tropical shirt with some stunning printing, only seen twice before, but it’s the facial expressions and hair that are perfect. With clean cut hair and a moustache, and a very happy selfie expression, and what I can only describe as the face of someone who’s trying to figure out how to take a selfie! He’s got a selfie stick and mobile phone, and it’s awesome to pose him in different places. LEGO has absolutely nailed this look. Mum’s got a brand new pink top on, with some cargo pants complete with printed pockets. She’s also carrying a bottle of water. She’s pretty happy, and what looks like a face like she’s sleeping? It’s an odd choice. Maybe if she blinked in the photo with Dad? Her hair has been seen a few times before, but it’s not common, appearing in only three other sets. The younger daughter has a pink and white striped singlet on, with a cat face on the front, and some blue shorts and shoes – yep, triple moulded short legs! These were originally created for The Simpsons sets, so it’s great to see them used more widely. 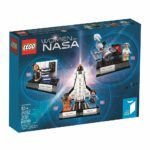 The hair looks awesome, and has only been seen on Margaret Hamilton from 21312 Women of NASA. She’s also carrying a water bottle. The older daughter also looks great in a purple tee and blue hoodie, with a smiling expression, and a happier one with sunglasses on. 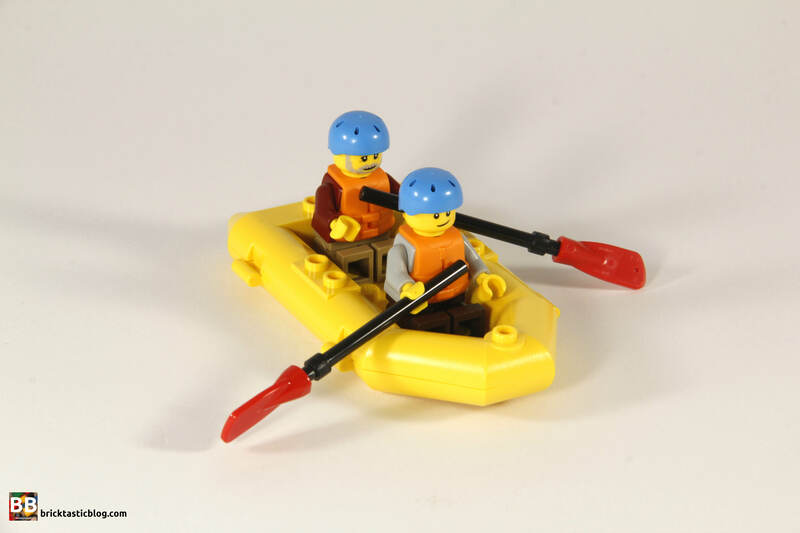 There’s nothing new with this minifigure, but it’s still a nice addition. This one doesn’t need to hydrate, thinking her phone will suffice. 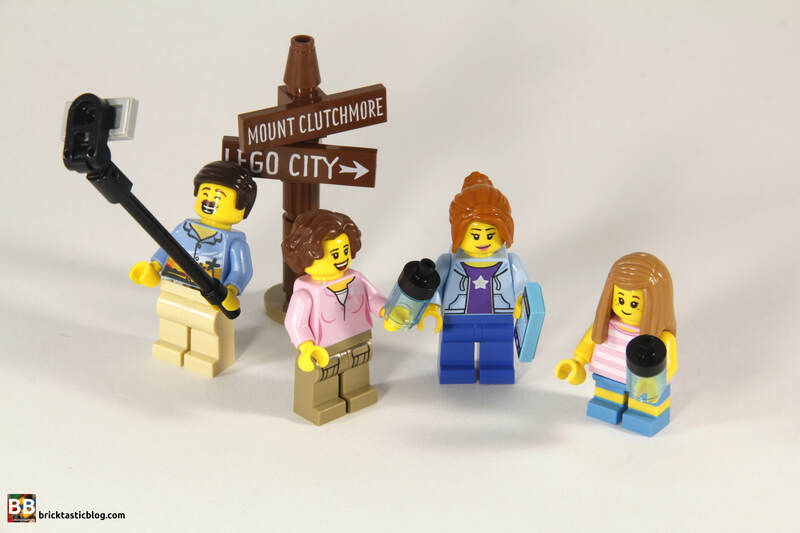 The whole family is standing in front of a wooden signpost, with a arrow to LEGO CITY, and another for Mount Clutchmore, where they are right now. These are printed tiles, and the look of the sign is excellent! Well worn but useful. Next is the camping duo of the Mum and daughter. The daughter is wearing a brand new purple three coloured jacket, black pants and has glasses on her head. She looks excellent. Mum is pitching the tent, and has a pink puffer jacket over a white top, and some excellent and modern looking new hair, as well as glasses on her alternate face! She’s carrying a hammer to get some pegs in the ground, and there’s also a simple lantern with them. The exciting part about this build is the tent. 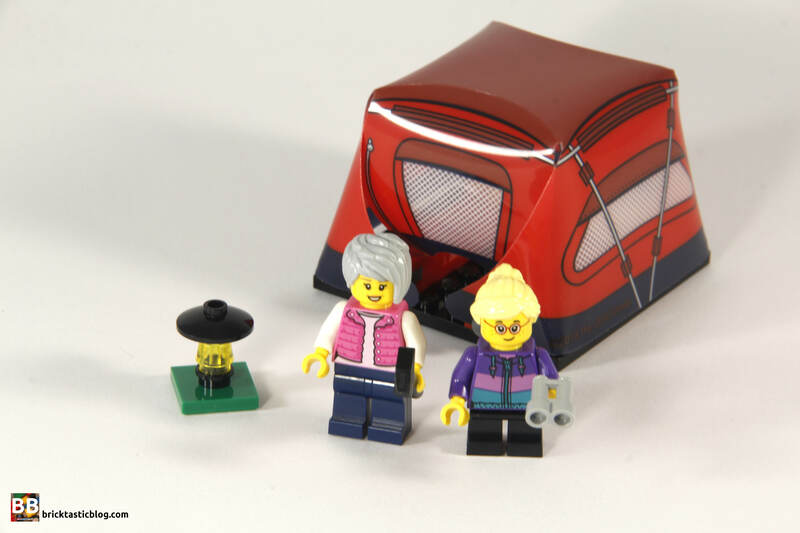 We’ve had a few tents with LEGO before, but they’ve only been the standard A-frame tents (aside from a very interesting fabric tent from a DUPLO set from 2012), but this is a more modern tent. There’s also a similar one in 41339 Mia’s Camper Van which will be reviewed in the coming weeks. This tent looks superb, and can fold up to also allow you to open either end without damaging it. The netting is a little see-through, and there’s enough room inside for a couple of beds big enough for a minifigure to lie down on! It’s brilliant. and will come in handy in the future! Lastly, there’s the rafters in their raft. It looks like a Dad and his son. The son is wearing a grey jacket over a dark red tee, and the Dad has a new grey bearded head and new zip-up dark red jacket over a light blue tee. It’s excellent to see the new head, as previous older males have always been the stereotypical grandfather, with glasses and wrinkles. This is much more versatile. They’re both wearing dark azure helmets, seen recently in a couple of Arctic CITY sets, and have a couple of paddles with them. I love these paddle blades! They’re an excellent addition. They’re also wearing a much more modern and exclusive life jacket. This element looks absolutely perfect. They’ve finally got it right! 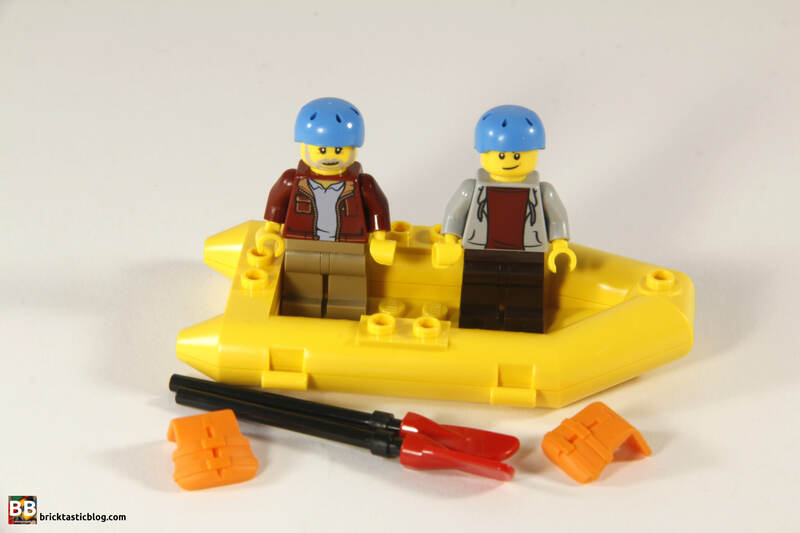 The yellow inflatable raft hasn’t been updated in over a decade, but it still looks excellent, and is always a welcome addition. So that’s it! It’s a big list of awesome elements. There’s a stack of new pieces, some redesigned old ones, and some old favourites back for another run, as well as plenty of options to flesh out any city build. 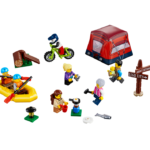 I’d highly recommend this set – there’s definitely something there for everyone, even if you’re not the outdoor type!